Our in-house nutritionist, Anri Horne, gave us her 6 reasons for loving our new superblends! Have you ever found a new health product on the shelf that looks amazing, and just as you start getting excited you turn it over and see a long ingredient list full of foreign, non-food items? What a let-down! Luckily this won’t happen when you turn over one of our Superblend tubs. They each contain only 3-5 ingredients and each ingredient is a normal wholefood you would find in your cupboard. Not that we think everyone should be ditching milk and meat for good, but reducing consumption of food products that take a toll on our environment is in everyone’s best interest. Animal farming is the biggest contributor to climate change, and the world’s forests, the natural ‘carbon sinks’ that absorb greenhouse gases, are being destroyed to make way for animal grazing. So in light of that we thought we’d leave the animal products out this time. Even if you’re still a big dairy drinker, you’re guaranteed to prefer our Superblends with alternative milk. Coconut, almond and oat milk pair so well with these blends that it seems like they were made for each other! Using alternative milks (depending on the type and brand) can greatly reduce the calorie and sugar content of these hot beverages, which is a hot topic after the release of the UK’s new sugar reduction targets for 2020. It also means you can enjoy one of our lattes without any guilt! While the scientific evidence for this being better than regular sugar is lacking, there’s something to be said for the use of this less processed sugar. Because it has undergone less processing, it contains more of its natural nutrients like iron, zinc, calcium and potassium, which normal table sugar doesn’t (1; 2). It also has a lower glycaemic index than regular sugar (3) and isn’t quite as sweet, so you won’t be craving more. And we don’t hate the natural caramel-like undertones either! We tried to make something that people want standing out on their kitchen counters, and we nailed it! Each Superblend comes in its own stunning metallic colour, and we just love how they look next to each other. And the timing of these little metallic gems couldn’t be better – did someone say Christmas tree decorations? Stocking fillers? Centre piece decorations? Autumn and Christmas is all about having a hot bev in hand, and if it’s got an insta-worthiness to it, all the better! 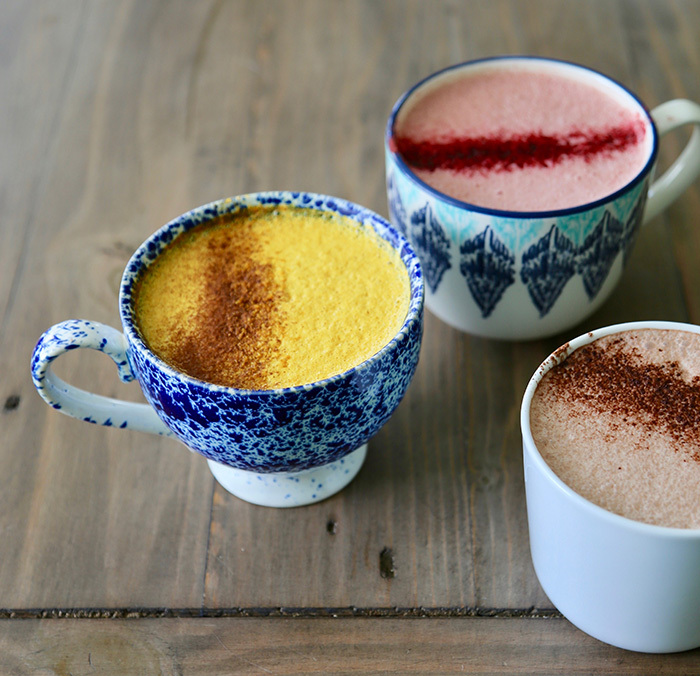 Get creative with the colours, no one’s stopping you from mixing a bit of Beetroot Superblend into your Golden Turmeric Latte for a sassy orange pumpkin latte colour. Otherwise a mug of pink Beetroot for you and a Raw Cacao for your friend in hand makes for a great post of a night in spent with your best out of the cold weather. It’s safe to say we adore our new Superblend range! Please leave a comment and let us know what you love about them?